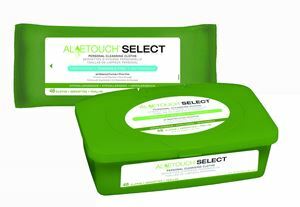 --- 9" x 13" 8" x 12"
Aloetouch Wipes by Medline Canada are designed to provide gentle patient care. Can be used on any type of skin as the wipes are skin-friendly. Wipes can be used to clean, moisturize and soothen the skin to keep you fresh all day long. Available with a light fragrance of Aloevera. Available in packets and tub versions.